Boost Your Energy with This Amazing Smoothie! Feeling a bit draggy today? Try this simple, healthy and environmentally friendly smoothie recipe that will keep you going through the day! Chia seeds are not only packed with healthy Omega-3 oils but also are one of nature’s highest plant-based sources of complete protein, which will keep you energized all day! 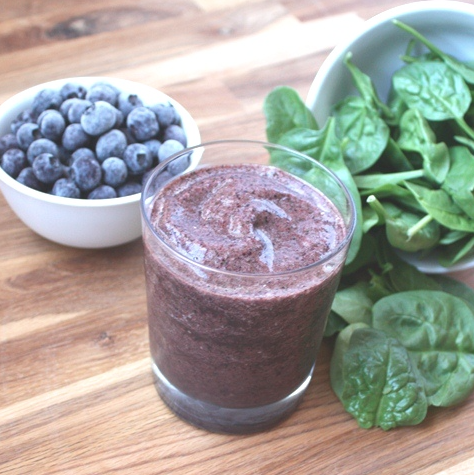 Additionally, blueberries, ginger, and spinach are full of important nutrients and vitamins that will keep your body and mind replenished throughout the day! Thanks Young and Raw for this delicious recipe! Previous Previous post: Get Killer Abs! Next Next post: 5 Tricks to Keep You Looking Pretty While You Work Out.